Nevertheless, that question – Are you an artist? – seems to travel everywhere I do. And it always makes me…pause. “Not really…” I start out. Then follow-up with an awkward list of what I do – none of which falls into traditional artist categories: fine art, craft, music, dance, etc – but does included working with you – the real artist. If what I’ve just written is true, then what keeps us, keeps me, from owning the name that most accurately describes my calling? For as long as I hold back from what is pretty obvious to everyone else, I have no chance of being the artist that I am. Am I afraid, once I own it, that now I have to live up to it? And what would the “it” be that I’m imagining I have to live up to? The torn jeans and orange hair? The collective mandate to starve, go mad, and join a cult? Maybe I’m treading on the posted territory of my parents (painter/writer), where the fine print at the bottom of their love contract with me stated that I would be loved as long as I didn’t go after their creative power. Or perhaps I have a limited identity of what it means to be an artist. I’m looking at product (paintings, sculpture, compositions…) instead of process (creating, inventing, designing…). Could be I’m just chicken, as claiming my artistic mantle carries a responsibility I’m afraid I can’t live up to. Before you, the artist, can move forward into the world with your art, some part of you must be willing to stand tall and hold out your “artist” name for the rest of us to clearly see. And it will be the clarity of your voice, the sparkle in your eye, and the confident delight of your response that will cause us to turn and view your work with a renewed interest, ask you for more information (like your website! ), and count our blessings that we discovered you. So in the spirit of my new personal business persona, I stand before all of you – my merry band of artists – and say to you: Yes, I am an artist. P.S. Because it seems I’ve caused a bit of confusion, let me restate what I put in a comment reply: I am not a visual artist, as in sculptor, potter, or painter. I am an artist as in passionate creator of what will help you, the visual artist I serve, put your art in the world and sell it. The Interweb is my canvass, words are my medium, info-products & events are the creative result, i.e., the smARTist Telesummit, Sell Your Art Bundle, Writing The Artist Statement, and one-on-one art career coaching (to request a free consultation, email: ariane@smartist.com ). Your Turn: If you had to take a stab at it, tell me why you do or do not call yourself an artist. What does it mean when you answer to the name of artist? Ariane- you are an artist because you exude creativity from every pore. Oh, Sharon, how sweet to hear from you! I was using myself as a template in this “past” post (technically, I’m still on vacation ;-0) to open up a discussion about what happens for each of us, as artists, when we embrace that identity – or don’t. Do you remember a time when you started calling yourself an artist – out loud – and what that was like for you? There was a saying I ran across. A laborer works with his hands. A craftsman with his hands and head. An artist works with his heart, his head and hands. Everyone who works in what they love is an artist from an actress to zookeeper. It is the passion in whatever profession that makes one an “artist”. @Ariane-Thank you for reminding me that even though I do not create fine art, I am still an artist. My art helps people live their lives more fully. Esther, I think you’re onto something here, though at the moment I’m having second thoughts about how much and how often we use the word “passion” currently. What you’ve stirred up in me with this comment relates to the way we use “art” in our every day conversations – as in “the art of golf,” or “the art of selling,” etc. I have to chew on this a bit more, but at least you’ve got me chewing!! You are a writer, and writers are very creative artists in my mind. Plus you are an advocate and supporter of art and artists, so I think it’s fair for you to answer to the title. I let myself be called an artist, although I understand the hesitation. I’m no Van Gogh or Picasso, but I paint and draw, and have studied art as my major in college, I’ve even taught art, and my working title for the state job I hold is “graphic artist.” I’ve been in the field of graphic art for over 20 years, and I’ve been oil painting since I was 8 years old. But as a Fine Artist, I have a long way to go until I’m recognized beyond my own community. I’m still shy about approaching galleries with my “art” and although I’ve shown my paintings in group shows, small venues around town, and other events, I am reluctant to venture into the world with my art. The internet has provided me a platform that is “safe”for me, because I can post my paintings and resumé without actually coming face to face with a gallery owner. I still have the fear of rejection in that arena. Anyway, enough about me. If someone asks me, are you an artist? I usually say, yes, that is my ambition if life. Oh, Patricia, I’m touched that you felt comfortable enough here to open up such a tender spot in your art journey. Artists can often be handicapped in a way that other professionals are not because what artists do is so deeply personal – pulling visions from their soul into this complex, multi-layered 3D reality. And who, in their right or left mind, would want their soul rejected? That said, I gently suggest that maybe, since you’ve opened the courage box here, you might be getting ready to explore new possibilities. (my ambition IN life, that is). Ariane, I just loved your blog article today. Especially the part about the nose ring, orange hair etc.. For a long while I labelled myself a “wannabe artist”. It wasn’t until I took your Right-Brain Business Course with Jennifer Lee and I started to slowly get my art biz up and running that I can now actually call myself an “artist” … and a damn hard working one at that! I’m so proud to be able to say that thanks to your help. It wasn’t until I put in the time making my art and then ensuring it got out there in a myriad of ways that I truly felt like I was achieving something. People are so intrigued by the fact that I can confidently call myself an artist — it makes for interesting conversations everywhere I go and a much more vibrant life! Being an artist isn’t what you wear, I feel it’s more about that energy you channel outwards that keeps people intrigued by who you are and what you do. Oh, Michele – how fascinating that it was the entrepreneurial side of being an artist that tipped the identity scale for you. That is quite rare and says a lot about how you are embracing the whole journey and not being caught and held in the seductive net of creative flow. Ariane, I was so afraid I wouldn’t be able to handle the entrepreneurial end of things but I slowly discovered I have it in personality to also love to do that kind of stuff. There’s still a lot I have to learn about improving and refining my techniques in this area but it’s an adventure, I’m enjoying embarking upon. I have been reluctant to call myself an artist. (in spite of the fact that my email address IS “artist@…”! I think the reluctance is because of some “artist” folks I have known are a bit, well …obnoxious. But I’m fine with calling myself a “painter” because that describes “doing” instead of “being”. 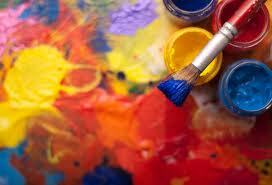 In my heart, I truly know I’m an artist – with an artistic/poetic perspective all my life, before ever starting to paint. So I have no problem if others “label” me an artist, it just doesn’t roll easily off my tongue. That said… it was awareness of marketing that caused me to use the word “artist” in my email address. So… maybe this is all false modesty! Oh, Dorothy, the “being vs doing” story – I love it! So often, in what I call “traditional” spiritual circles, it’s implied that to be really spiritual, it’s the reverse – more being, less doing, which I happen to think is a false dichotomy (even though I understand the point it’s trying to make, that doing distracts us from the still small voice of Being). I suspect those are red herrings because identifying yourself as who you really are comes with a much higher set of personal risks. I could suggest a few, simple exercises that might tease these out for you. I’m still on vacation (couldn’t you tell? ), so right now isn’t a good time. But if you want to email me at: ariane@smartist.com mid-Sept and remind me about this blog post, I’d be happy to send them to you then. Lately I’ve noticed the word “Creatives” used replacing the word “Artists” I like it since it covers more territory.